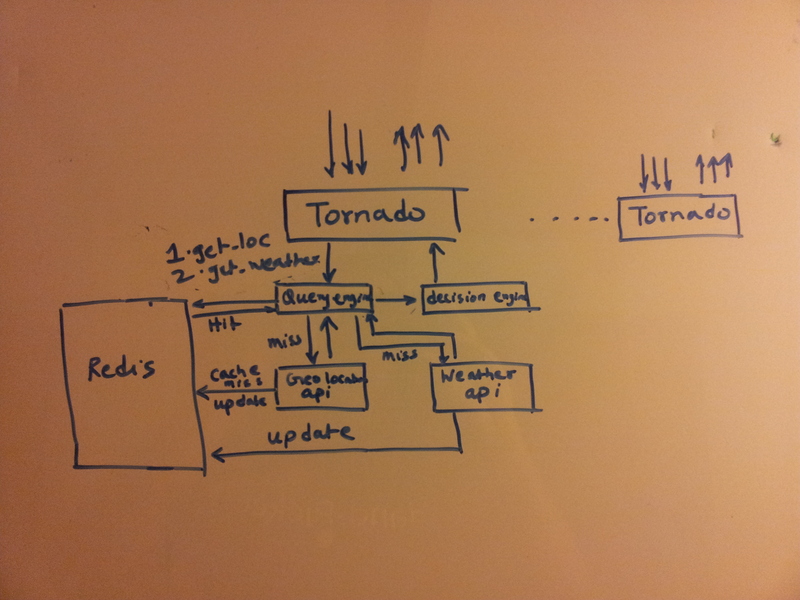 How I built a weather decision engine? or The story of wearthejacket.com | Thinking about software, life, the universe and everything. So as I was stepping out of my apartment last week, I thought in california I really don’t care about the temperature outside, all I want to know is if it is cold enough to wear a jacket or warm enough not to. I decided to build a weather based decision engine which does just that, figure out where I am, check the temperature and give me a decision. I also wanted it to be blazing fast and scalable. The first step was to think how I could achieve this. After some thought I came up with this sketch. http://freegeoip.net/, which is a great api for a project like this with access to 10000 api calls per hour before getting throttled. This was more than sufficient for my needs. The other component was getting the weather information. After googling for a bit, I came across forecast.io which though being a robust api had a free cap of 1000 calls per day and a nominal payment after that. The hosting was on a AWS(Amazon web services) small ubuntu linux instance. I decided to use tornado over apache mainly due to its low memory consumption during idle time and since I was going to write this in python. The decision to use Redis was a simple one as I would definitely need to cache some values as the end user requests came in. This was the first pass I wrote. 2. webserver queries geolocation api and obtains end users coordinates and location. 4. Finally take a decision based on the prevailing temperature. The decision algorithm being very simple based on a pre-set threshold below which wearing a jacket is advised. This is a todo for future enhancement. Note that I had not written the caching mechanism yet. There lies the fun part. At this point the decision was taking well over 1 second. Certainly not acceptable for a public facing web application. Enter Redis. Redis is an in-memory key-value data store. That makes lookups blazing fast. The first thing that I needed to do was to cache the location information that we pulled from the geo-location api . The location information that the application needed were the latitude, longitude and actual city name. This made it a good candidate for the usage of a Redis Hash. Since this data will not change rapidly even with dynamic ips we can keep these mappings forever and over time as user queries come in build our own database of ip’s to locations. This is a simple redis key value pair location:apparentTemperature the only caveat being we want it to expire every 10 minutes(configurable). Once the cache mechanism was in place the benchmarking showed dramatic improvements. Sub 30 ms response times after the first api call was made. The first api call to the application though was still remarkably slow. Then I started looking at individual api calls to the external services. There lied the answer, the forecast.io api was spewing out an entire days worth of data. which had the effect of only giving back the current prevailing conditions. Once this was done came the part to write tests. Not true Test driven development but I was’t launching without baseline tests. This part took me the longest time but greatly increased confidence in the code for launch. As of now it has run for over a day serving requests across the globe. Always write tests, preferably before even the first line of code. The components are modular so that you use individual components. Would love to know your thoughts on how this project can be enhanced and or design decisions that you would make. The source code is released under the GPLV3 license. 1. C: Great job! I like the design since it keeps things simple and focuses on fast response times rather than a cool UI. 2. C: As it’s modular enough, different components can be enhanced independently. This I like. 3. Q: Does your applications work with ipv6? I think freegeoip only supports ipv4. 4. Q: How did you do your benchmark testing? A brief overview on your blog would be helpful. 5. Q: Not sure the cache currently expires in 10 seconds? The “expire” variable is set to 180, so I am confused. 6. E: I think you can provide a weather report snippet (at least Celsius and Fahrenheit) to your output. 7. E: Port this onto chrome as a plugin. Anything that doesn’t need people to submit a URL in their browser. 8. E: Now that things are working you can focus on the UI. For example, the background should provide information about the decision. That is, If you need to carry a jacket, the background could be rainy/cloudy/snowy/etc. If not, then it could be sunny/hot/etc. To start with just two images should be fine. 9. E: As you pointed out, the decision engine can be enhanced. I don’t have concrete suggestions here, but there is always room for improvement with these things. C.Great job! I like the design since it keeps things simple and focuses on fast response times rather than a cool UI. Q: Does your applications work with ipv6? I think freegeoip only supports ipv4. hk:I do not know, since the freegeoip api does not mention this probably not. Thanks for bringing that up though, somthing to consider for future enhancements. Q: How did you do your benchmark testing? A brief overview on your blog would be helpful. hk:Will tackle this in another post. Q.Not sure the cache currently expires in 10 seconds? The “expire” variable is set to 180, so I am confused. hk.10 minutes in the actual app, in the released code a value of 180 would mean 3 minutes. Great suggestions on the enhancement side, will try to implement them.